And I'm not talking about beer. I'm talking about something I've been wanting to do since December 1st for Christmas. But it didn't happen. Instead, best way to start the New Year.... is right here. A Take One Down and Pass it Around GIVEBACK! 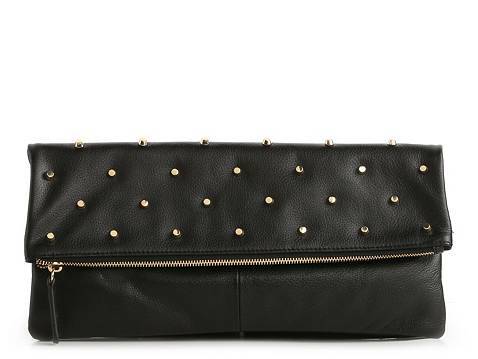 Specifically, the Black Leather 'Raina' Studded Foldover Clutch. Y'all, but it gets better...can you believe it gets better???!!! And that winner can pass on one of the winnings to their BFF. Or their mama. Or grandchild. Or a stranger. Take one down and pass it around....... do you get it?!! Creative genius, soy yo. No, but really I like the idea of passing it on. Of sharing. Of make love, not war. You feel me? For extra entries: *'like' my Facebook page at right here <--- just click there, see how easy! *follow me on twitter @agirlnamedgay <--- once again, just a click away! Leave a comment for each entry. That's a total of FOUR entries to win TWO freaking amazing clutches. Valued at over a million dollars but yours for free.... if.... your name is drawn out of the hat. Winner will be announced Monday evening. Good luck and Happy New Years! Is this the infamous Natalie Greenwood?!!! Do you know your kids go to the same elementary school i went to? i feel like I kinda know you! I would give the other clutch to my friend Sara - she had a rough 2012 and I would love to give her something to cheer her up. Ahhh, I want that clutch! I'd give the second one to my Sis. Oh me, me! I would give the second one to my sis! oops! The above comment was mine! I would give to my friend who just lost her baby, just a little pick me up! I would give this beauty to a one of my sisters! I follow on FB also! I would give it to my sister??? I just don't know which one. surely you could come up with some contest where'd they have to win it, right?! Laura and Leigh in hot competition, this could be good! I would give the other one to my work bestie! She is always there for me, & is such a giving, thoughtful person. Love the blog, love the clutch! My sister Libby would LOVE the 2nd one! I also follow the blog, like on FB, shared on Insta and FB. I would give it to my cousin Ashley. She always so willing to help me out when I need a friend!! Definitely my sister! She would love it. Okay, so I would give the clutchy clutch to someone real special. My sis-in-law is flying me out and it would only be appropriate. I will even be there when she announces the winner and I would hand it right over. I'd give it to one if my sisters....guess I was forced into that. Ohh! I would probably give the other one to my mamacita. She is always in need of a good wallet! Oh that's a beauty! - I'd probably give the second to my big sis Kady cause I know she'd rock it! Still following this amazing blog! Liked "a girl named gay" when the fb page was just a baby. Shared on fb. Wowza. If only I could figure out how to tweet! I'm hosting bunco this month I'd add this fun accessory to the prizes! I would share this with my best sister friend Shelly! :) Love you Gay!! !